After Chelsea's poor start to the season, manager Jose Mourinho said winning the title "was a job for Mission Impossible star Tom Cruise". 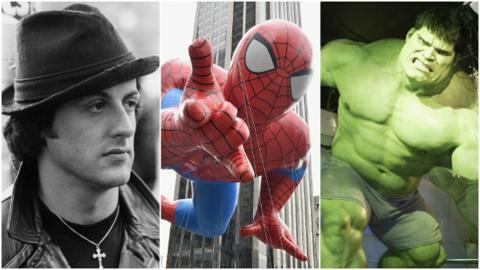 But which film star or character could you do with in your team? We asked BBC Sport readers for their suggestions on the hashtag #bbcfootball - and this is how they responded. At the back, Twitter user Trev nominated Dr Emmett Brown from the Back to the Future trilogy as he could take Aston Villa back to 1982 and the scene of their finest hour - a European Cup win. Sylvester Stallone's heavyweight champion of the world, Rocky Balboa, is at centre-back, with reader Danny Johnston saying Chelsea "need a real rock in defence." He is partnered by Batman's nemesis, the Joker, with Neil Saldanha saying: "Any team would love the Joker playing centre-half. He would sort a striker like Diego Costa out in no time." Making up a formidable back four is versatile actor Johnny Depp - as Craig Alan rightly points out the Edward Scissorhands star "can play any role". Good luck to anyone taking on midfield duo Arnold Schwarzenegger and the Incredible Hulk. Action star Arnie would walk into any team but Auay Jokesomefun suggests he could be the anchor man that Arsenal are missing, while the Hulk - don't make him angry - was also suggested as an option for the Gunners by Tony Mcginnis. Are Chelsea's title hopes a Mission:Impossible now? You need speed on the wings and in Forrest Gump and the Flash this team has plenty of pace. Gump - who of course ran right across the United States - has plenty of stamina and Jay suggests he is the man to stretch defences for Manchester United, while comic book hero the Flash - who can react at light speed - is a better transfer target for United than Cristiano Ronaldo according to Martyn Hearne. In the hole is fictional footballer Santiago Munez. The hero of the Goal trilogy, Munez starred for both Newcastle and Real Madrid and could probably help Steve McClaren out now according to Jay Ross. And up front, who better than Ted Striker, hero of 1970s comedy classic Airplane! As Jamie points out, he could also do a job "on the wings."